At last we are finally getting to see Arsenal in action again, and our first opportunity to see Sead Kolasinac and Alexandre Lacazette in action for the Gunners. Arsenal fans may well be expecting an easy game against the Hyundai A-League side, but we have to remember that Sydney FC were actually the Champions and haven’t lost at home in the League for over a year. They did lose 3-0 in a friendly with Liverpool just after the end of last season, but as this is Arsenal’s first warm up game we can’t expect them to be as fit as Jurgen Klopp’s side was in May. A near capacity crowd will be on hand in Sydney on Thursday night as Arsenal take on Hyundai A-League champions Sydney FC in the Premier League club’s first visit down under in more than 40 years. *Wenger confirmed Arsenal’s record-signing Alexandre Lacazette would feature during the match. *Championship heroes Danny Vukovic, Filip Holosko, Bernie Ibini and Milos Dimitrijevic are no longer at the Sky Blues. *Gunners stars Mesut Ozil, Aaron Ramsey, Olivier Giroud and Theo Walcott are in the squad, although Chilean superstar Alexis Sanchez didn’t make the trip to Sydney. 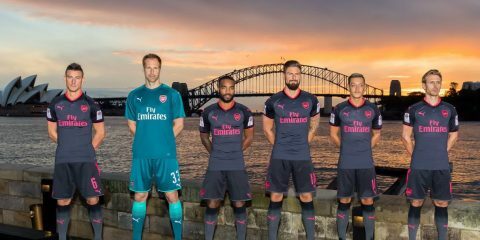 “Arsenal is a club that a lot of football coaches in Australia would look at and admire the way they play. In a lot of ways we try to replicate what they do in the way they play the game. “We know it will be a massive crowd and there will probably be more Arsenal fans than Sydney FC but it’s for the good of the game in this country. “I don’t know a lot about them [Sydney FC] but I know they have been very successful. We don’t have the privilege to watch Australian football in England. It’s never easy to predict what’s going to eventuate in what is a first pre-season hit-out for both teams. But it should be a wonderful occasion in what should be an entertaining clash in front of a huge and noisy crowd in Sydney’s west. This is the best bit. Arsenal are providing a live Matchday show from Sydney to watch the game, with commentary from the ex-Arsenal players Adrian Clarke and Nigel Winterburn. So get comfortable and sit back and watch the Lacazette show! This entry was posted in Arsenal News, Arsenal NewsNow, Arsenal previews on July 13, 2017 by Admin. Just watching videos on Lemar’s skills. He is definitely better than Mahrez and I think worth £45 million. And he is 5 years younger at 21 years old. Plenty of time to get even better. He can play both wings and CAM. So he can push Ozil and Theo. He is excellent at crosses, passing, set pieces, long shots, dribbling, set pieces, holding on to the ball. He scores loads of assists and goals once in a while. Off a video – take a seat. How weak’s that. Riyad was premiership player of the yr in his 1st season – lean back – pause!!! Sydney FC 0-5 Arsenal . Lacazette to score first. I want to see Malen. Have been longing to watch him that I have to skip my lectures today.